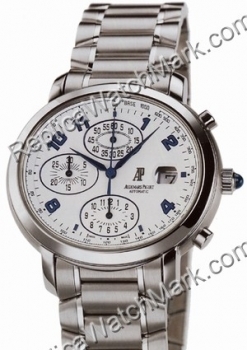 Stainless Steel Case & Bracelet, White Dial with Blue Arabic Numerals & Hands, Automatic Movement with Chronograph functions, Telemeter & Tachometer Scales, Magnified Date display at 3 o'clock position, Sapphire Crystal, Water Resistant to 20m/60ft. Solid Case Back. Case Diameter 40mm, Case Thickness 11mm.